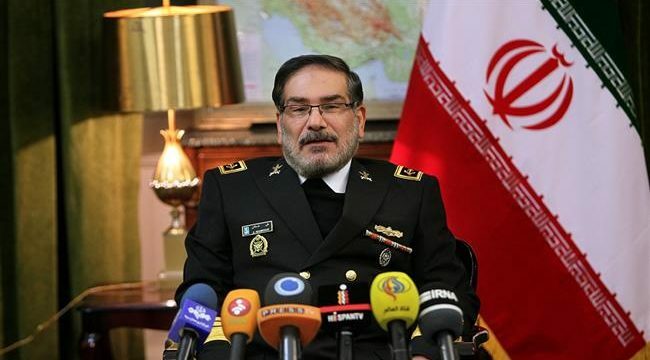 FNA – Secretary of Iran’s Supreme National Security Council (SNSC) Ali Shamkhani lashed out at the US for its paradoxical attitude towards the ISIL, adding that Washington is keeping alive the terrorist group like a “weakened virus” for later use despite claiming to be in fight against it. “The Americans’ behavior in the so-called anti-ISIL coalition is dual,” Shamkhani said on Monday. He noted that a part of Eastern Euphrates region in Syria is still under the control of the US militarily, and said that the American forces are not willing to annihilate the ISIL in the region “because they feel that the weakened virus of ISIL can possibly be used in future for certain projects against Syria”. Shamkhani, meantime, underlined that Iran has helped Syria in the war against the ISIL and other terrorist groups at the invitation of the Damascus government and scored eye-catching success. In relevant remarks earlier this month, a senior commander of Hashd al-Shaabi (Iraqi popular forces) had also said that the ISIL commanders were hiding at US bases at Iraq’s border with Syria and warned that Washington sought to use the terrorists as a leverage against Baghdad and Damascus. The Arabic-language al-Ma’aloumeh news website quoted Hashem al-Moussavi as saying that a number of ISIL leaders were sheltered at Iraq’s border with Syria to survive current attacks by the Iraqi security forces and Hashd al-Shaabi. He added that Syria’s al-Tanf base is the main stronghold of the terrorists and supplies the ISIL remnants with weapons, military equipment and intelligence, noting that Washington aims to use the ISIL commanders as a leverage to pressure Baghdad and Damascus. Al-Moussavi said that the Iraqi security forces and Hashd al-Shaabi are at present trying to cleanse Wadi Houran region in al-Anbar (at the borders between Iraq and Syria) from terrorists, adding that the US fighter jets often provide a cover to the ISIL moves between Iraq and Syria. The US-led coalition has long been suspected of colluding with the ISIL terrorist group in Eastern Syria for quite a few years now. Experts believe the US needs to keep a contained group of ISIL terrorists operating in the region in a bid to justify its buildup in Eastern Syria.